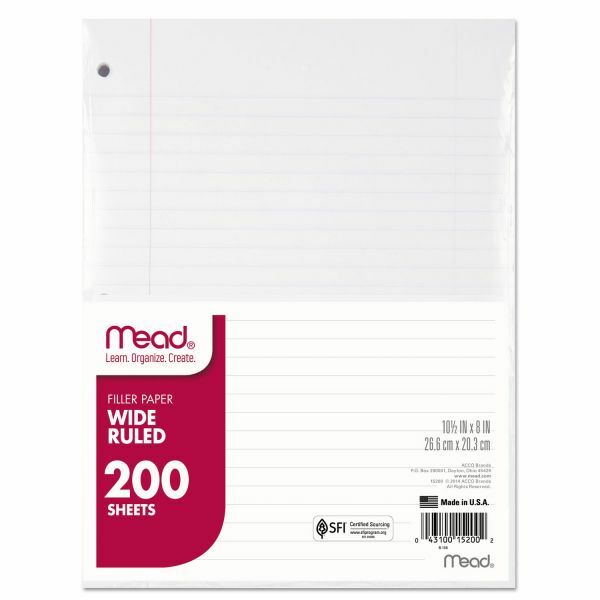 Filler paper is a perfect choice for all your notetaking needs. Filler paper is 3-hole punched with 3 holes for easy insertion in a 3 ring binder. Full page size of 10 ½" x 8". Note: A minimum quantity of 264 must be ordered, and in units of 24 thereafter. 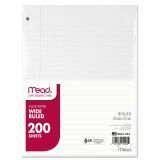 Mead Filler Paper, 3-Hole, 8 x 10 1/2, Wide/Legal Rule, 200/Pack - Back To School! White filler paper is three-hole punched and ready to insert into standard ring binders. Each 15 lb. sheet is legal/wide-ruled with 11/32" line spacings and a red margin line on the left. The wide ruled sheets give you plenty of space to capture all your notes. Heavyweight stock makes this paper extra durable so it will not rip out of binders.